The march of the Immortal Regiment in Moscow, 2015. Over 1,200 coordinators in 42 countries, are preparing to conduct the Immortal Regiment events, Sergei Lapenkov, co-chairman of the board of the interregional historical patriotic movement 'The Immortal Regiment', said. 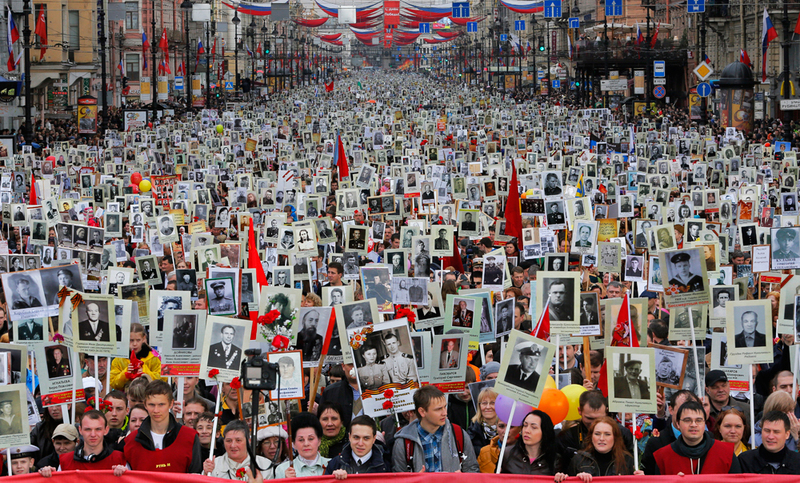 "As for Russia, the Immortal Regiment marches will be held in every region of the country. In terms of numbers, 4.5-5 million people marched in 2015, and, most likely, one can expect a number of 10 million participants in 2016. But it is not essential for us, we view this as a personal history of each soldier and each family in particular, and we do not pursue setting a record in the number of participants," Lapenkov said, during a press conference at the Interfax press center in Tomsk, on May 5. Not only does the number of the countries participating in the events increase yearly, but also the number of cities in the countries, he said. "For instance, in Israel, the Immortal Regiment marches will be held in twelve cities at once this year. Year by year, new states in the U.S. are being added, where the relatives of soldiers from the allied countries, which fought in World War II, will participate in the events as well," Lapenkov said. The events will be held in such remote populated localities, as the settlement of Provideniya, in Chukotka, he said. "This year, they will participate for the second time, but because of a poor Internet connection we will, probably, receive information from them a while later," Lapenkov said. In turn, co-chairman of 'The Immortal Regiment' board Sergei Kolotovkin said that, abroad, the holding form of the events may vary from the Russian one. "For instance, in Beirut, where the military topics are approached with a very cautious attitude, all of the events are being held indoors. In some countries, people gather near monuments, in some places, they march along the streets," Kolotovkin said. He also noted that the modernization of the movement's website moypolk.ru, which is devoted to the compilation of veterans' stories, was funded by grant projects over the past year. "We never had funding, but in 2015, we won two grants, which we spent on upgrading our website and its servers. Currently, the traffic is heavy, but the site works. The funding was also spent to reconnect the long-lost relatives of the veterans who had found each other on the movement's website," he said. Denis Bevz, a coordinator of the movement, said that, currently, the website contains 322,000 stories of World War II veterans.